In April a reddish mist seems to hang over the wooded hills of the Finger Lakes. The Red Maples are blooming, a sign that all is well and it is truly spring. Red Maple is a literal translation of the scientific name, Acer rubrum, and this tree lives up to its name. 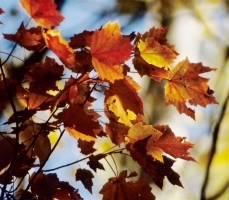 It doesn’t have leaves that are red all year, like the red-leaved cultivars of Japanese Maple and Norway Maple (confusingly, these are also sometimes referred to as Red Maples), but their flowers are red, their winged fruits (samaras) are red when they first emerge, and the buds are red. The newly-emerging leaves are red; and although they soon turn green, they turn a bright red again in the Fall. Even the young twigs are reddish-brown. 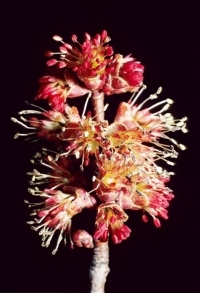 The flowers look superficially like the petal-less flowers of the Silver Maple (see Plant Profile, March 2005), although they bloom several weeks later and are, if anything, an even brighter red. 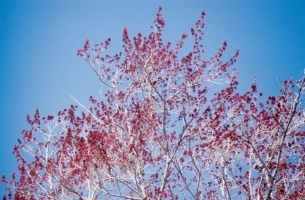 Like Silver Maple, Red Maple is often functionally dioecious (individuals have entirely functionally male or entirely functionally female flowers), either little fuzzy balls of pistils (the female flowers) or stamens (the male flowers). Both kinds of flowers are sometimes found on the same tree (monoecious), although individual trees are usually mostly male or mostly female. The fruits look a bit like Silver Maple fruits when they first emerge, but Silver Maple has some of the largest fruits of the maples, while Red Maple has some of the smallest. Red Maple fruits occur on very long, dangling stems. They are usually bright red, turning tan. The leaf buds are also red, as are the emerging leaves, so the red haze of a Red Maple woodland lasts for weeks in Spring. The Autumn color of the leaves is generally a brilliant scarlet; it is one of the showiest of our native trees. With all its advantages, you might expect it to be one of our most popular street trees, but actually it is seldom planted. Perhaps it is just too familiar, as it is one of our most common woodland trees. Unlike the Silver Maple, it is not generally confined to the wet lowlands; it grows there, but it is very adaptable and just as common on dry hillsides. It does not have the Silver Maple’s problem of the occasional sudden and catastrophic loss of major branches. Although it has a reputation for “rootiness”, having the typical maple feature of a mat of surface roots surrounding the trunk, it is less of a problem this way than the much more popular Norway and Silver Maples. Red Maple seems to be more tolerant of pollution and urban conditions than many of our other trees. I have seen some magnificent specimens in New York City parks, where forty-foot-high flowering plants seem to be right in scale with their surroundings, and where they bloom several weeks earlier than they do here, adding a jaunty touch of spring to the drab late winter cityscape. They could do the same for our Upstate townscapes as they do for our hills.